Blue Opal ~ "...celebrates spiritual balance", and the "...flirty blend of watermelon and lilac is great for active types who pride themselves on composure and balance". Additional notes include red berries, rose and wet skin accord. Ruby ~ "...evokes passion and confidence", and "...its sweet, romantic blend of peach, rose and vanilla will appeal to your bold and passionate side". Additional notes include melon, bergamot, freesia, raspberry and sandalwood. Purple Diamond ~ "...suggests mysterious intrigue" and as "...the sultry scent of the three, has hints of blackcurrant and jasmine to bring out your mysterious charms". Additional notes include plum and vanilla. 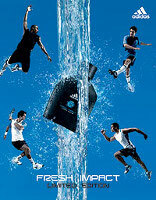 Adidas will launch Fresh Impact, a new limited edition fragrance for men which embodies "all the facets of sport", this coming March. The fragrance notes include limone, "cut chlorophyll"*, watermelon, ginger, nutmeg, water mint, patchouli, amber and frozen musk. * The original German says "geschnittenes Blattgrün"; perhaps one of you German-speakers can help us out. "Fresh cut leaves", maybe? “geschnittenes Blattgrün” loosely translates to “cut green leaves” but perhaps means “cut green grass” in terms of fragrance notes. Now, as a native German-speaker, I'm not really sure whether “geschnittenes Blattgrün” does exist at all in proper German, but I suppose “fresh cut leaves” is as good a translation as any and probably what they had in mind. there were samples of these three fragrances in an issue of seventeen i got a few months back. in my opinion, the most tolerable scent was the red one, but they all smelled pretty generic and mostly of alcohol. I have always liked Estee Lauder because they rarely discontinue anything and if they don't have it they will get it for you if you ask, they're usually reasonably priced yet still well made. I say this because the staying power of EL's fragrances is remarkable on me – I have dry skin and have a hard time holding the fragrance for a decent period of time. I wonder if they will lessen their quality with these though? Will have to try them out! 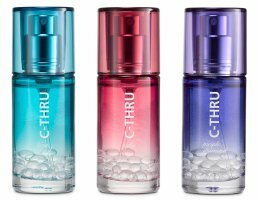 There's about a dozen of those C-Thrus already and all of them are very generic… some are wearable, some don't deserve to exist. I don't know if it's the same Ruby that's circulating here for some three years, but it's a fruity scent similar to Amor Amor. The Diamond is Amor Amor with more vanilla. I have never seen them before but thanks for the info and how disappointing! They were scent strips, you mean, or “real” samples? Really, a dozen? Where do you live? Ah well, the regular EL line is not outrageously expensive anyway!